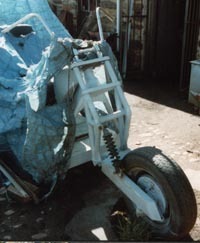 After wasting so much time, patching up rusty car body panels, this trike was going to be made from heavy steel, 100 x 50mm box section chassis 2 and 3mm sheet steel used on the floor and side panels. I fabricated leading link forks with a single sided, mono shocked, swinging arm, mounted with a VW Beetle 1303 front hub. I believe this has a larger drum brake than the standard 1300 beetles. NOTE: Picture opens in a new window when clicked on. I used 25mm solid steel yokes, large diameter moto crosser's fork legs, bent back towards the frame. It was braced with similar sized steel tube, to triangulate (strengthen) them. The swinging arm was made from 100 x 50mm box section welded to a custom made, phosphor bronze bushed, pivot. The triangulated tubes supporting the stearing head are scaffold tubes with all the galvanised zinc carefully removed around the weld areas. the gusset brackets are made from 6mm thick steel plate. All the seats are standard vw beetle, roll bar and rear seat enclosure frame was 64mm (2 1/2") tube, with 2mm sheet steel sides welded to it. I modified a king sportster tank, lowering the tunnel, and moving the filler to the top of the tank to increase capacity to 17 litres. The fuel tap, which was an old brass water tap, was moved to the bottom to get every drop of fuel out. However this tank was only the reserve, there was about a 6 gallon (30 Ltrs) tank hidden at the back. To fill that tank you simply opened the fuel (water) tap at the tank and filled up as per standard bike tank, when it was filled, so was the main tank, just turn the tap off and it is the reserve again. Gravity is great. Oh and free. Not even taxed. Yet. 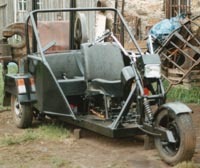 The engine was built from two running 1300cc vw beetle ones I had. I stripped the pair down and thoroughly cleaned and checked all components and rebuilt one using the best parts. It was finished with twin port cylinder heads and I made up manifolds to fit Triumph Bonnie Amal carbs. I also made up 4 stack exhausts, toped of with flaps to stop rain filling them. Above is a picture of the trike and the family, taken by my old man, when visiting him over on the east coast of Scotland, in Montrose. It ran and handled well, was a bit slow and a bit gutsy with the fuel, however I could not expect more, it was heavy and solid and built to last, or so I thought.